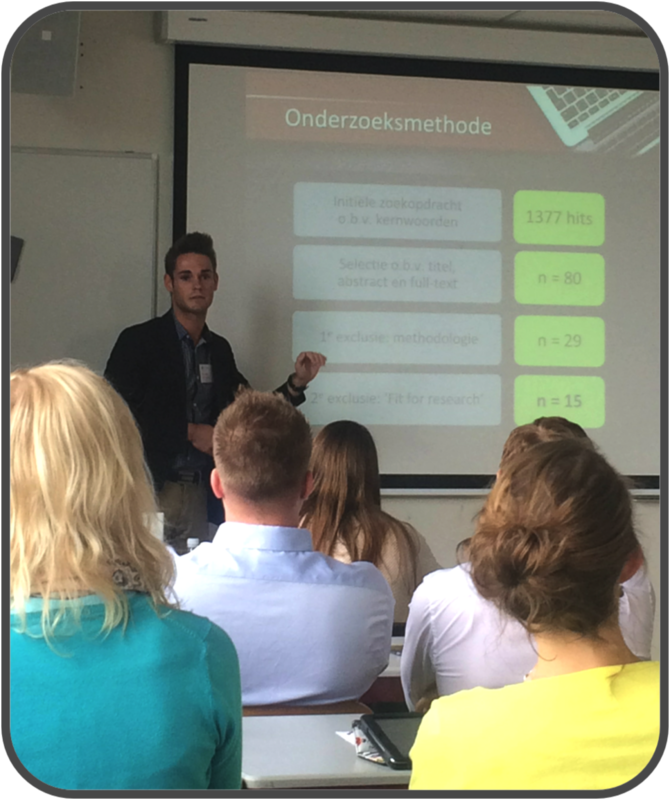 On June 17th the Education Research Days [Onderwijs Research Dagen (ORD)] took place in Leiden for three full days. Within the ICT division some of our ALO! researchers presented their first set of results. On Thursday, June 18th the symposium ‘Blended leren bij volwassenen: voor iedereen en alles?’ [Blended learning for adults: for everyone and everything?] was scheduled, with prof. dr. Bram De Wever and dr. Jo Tondeur as chairmen. Four ALO! researchers introduced their research. 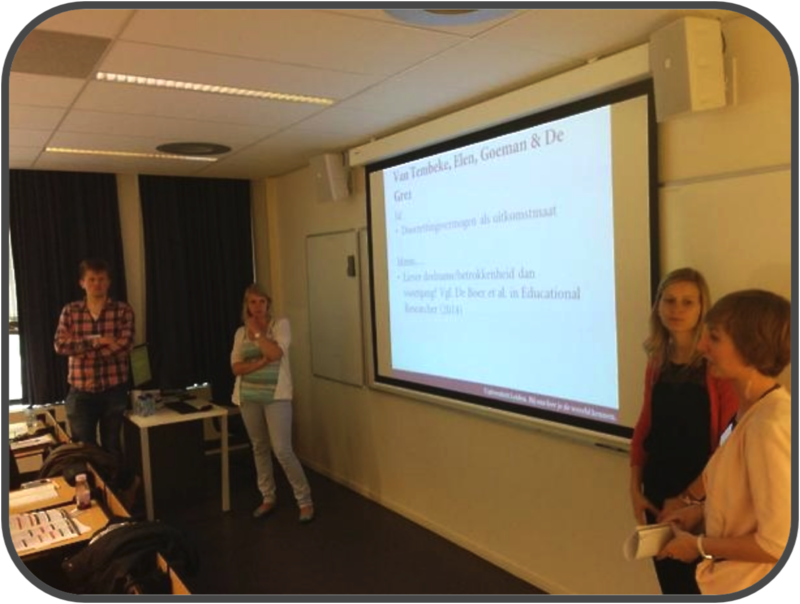 Silke Vanslambrouck (WP4) presented her study about students’ motivation profiles for blended learning in adult education. Subsequently Stijn Van Laer (WP2) introduced his research, entitled ‘escription framework for influencing interactions between personal and environmental characteristics in blended learning environments and their impact on learning outcomes.’ Ruth Boelens (WP2) demonstrated her review concerning existing design models for blended learning environments, and Ellen Van Twembeke (WP3) presented her study ‘Development of a descriptive and conceptual model for effective blended curricula.’ Following the presentations, a discussion session was led by prof. dr. Wilfried Admiraal. His initial feedback provided the necessary confirmation and brought to light some challenges with regards to the different studies. The audience was then invited to participate, which soon led to an interesting debate about the state, definition and place of blended learning within the (adult) education landscape. The entire symposium was a rich source of information, feedback and input for the investigators. After the symposium Silke presented her poster about blended learning in formal adult education and the impact of motivation regulation. This method enabled her to gain valuable suggestions and ideas for her future research within the ALO! project. On Friday, June 19th Brent Philipsen (WP5) gave a paper presentation on the results of his systematic review of qualitative studies. His research is on identifying successful strategies in order to professionalise teachers practice to teach in an online or blended learning environment. The discussion provided him with a lot of useful feedback. The participation at the ORD conference gave the researchers a chance to present the ALO project to a broad audience. This led to a lot of interesting networking, valuable suggestions, constructive opinions, and useful thoughts to reflect upon moving forward. With a lot of inspiration to continue their research and the ALO! project the researchers could return home again. In other words, the researchers look back with a sense of satisfaction on this enlightening first experience!